LONDON – Ten years after the 2007-2008 financial crisis, it is worth asking where the world’s developed economies are today, where they would have been had there been no crisis, and, perhaps more important, where they might have been had different policy choices prevailed before and after the collapse. Sep 26, 2014 Joseph E. Stiglitz wonders why EU leaders are nursing a dead theory. Apr 4, 2018 J. Bradford DeLong laments that obvious failures in the response to the Great Recession still have not been acknowledged. Jun 3, 2016 Nouriel Roubini warns that advanced economies can either boost potential growth or face harsh consequences. Mar 3, 2015 Ricardo Hausmann takes on those who say that the country needs to spend more. Sep 26, 2016 Nouriel Roubini welcomes advanced economies' incipient shift away from reliance on central banks to sustain growth. It seems that all the post-Global Financial Crisis commentary focuses on the contribution that zero and negative interest rates played in fostering the recovery. There has been a huge hole in the discussion - that of what caused the problem in the first place. Beginning in 1994 the U.S. Federal Reserve began to tighten the money supply in the mistaken belief that the near tripling in the stock market during the 1990s represented “irrational exuberance.” A closer examination of the data will reveal that the stock market was simply catching up with the inflation-impacted gross domestic product since the Great Inflation began its climb in 1964. The Federal Reserve increased its target interest rate from 3 pct in 1993-94 to 6.5 pct in 2000 which had the effect of sucking funds into the U.S. economy and undermining the financial stability of the “emerging economies.” Then the Fed overreacted to the 2000 stock market “correction” and the 9/11 terrorist attack by plunging its federal funds rate all the way down to 1 pct by mid-2003. Combined with the nearly $5 trillion trade deficit the U.S. accumulated between 1997 and 2007 following China’s 1999 admission to the WTO, the impact created what Ben Bernanke dubbed a “Global Savings Glut” and others have dubbed a “Global Banking Glut” which included a massive outflow of dollars that fled the U.S. The Euro appreciated about 60 pct. The impact of the tsunami wave of dollars were housing bubbles on a global scale and an economic boom followed by a commodities boom. In turn, soaring commodity prices spooked the Fed’s fears of inflation. In response, the Fed jacked its federal funds rate all the way up to 5.25 pct, effectively chopping the global housing markets and the global economy off at the knee-caps. The Fed's moves particularly impacted European banks which had borrowed heavily in the U.S. money markets, reinvesting the proceeds in longer term assets. Accordingly, there is a pressing need for the economics community to focus its research on the impact that the sharp swings in central bank policies have had on the global economy and on the prospects for growth. After all, how can economic actors plan when the economy is being jerked around so violently? I say that what's missing from economic theories is common sense. Common sense tells that you should be very careful trying to speculate about people's life because these theories do effect these lives after all. It makes me go crazy to see how my life my future becomes just numbers over economists disputes. When life and future are uncertain people tend to be reckless. Think this before throw theories. You mentioned Hitler , don't be sure that we avoided a new Hitler. There's just no mystery about what caused the slow recovery. It was inadequate initial response by government. Early on, there was some understanding that government deficit spending was going to be needed to allow government spending to replace the demand that had been lost, but the response was always too little, too late. And this allowed the merchants of fog to claim that stimulus spending doesn't work. Stimulus spending does work, but it needs to be adequate for the task at hand. Stimulus spending worked in China, where the stimulus was around 15% of GDP. It didn't work where it was around 2% of GDP. Stimulus spending worked to end the Great Depression, as governments ramped up deficit spending on the military. Too bad that it took a war to finally persuade governments to do what common sense should have told them was necessary all along. Actually, the largest portion of the fiscal expansion in the immediate post-crisis period had the same purpose and effect -- to support asset prices at levels unjustified by income flows -- as the later monetary expansion. The switch after 2010 just parked government liabilities with central banks. But the use of the funds generated by those liabilities was largely the same. In both cases, asset price stabilization was given priority. Would that have changed after 2010, had governments been given more latitude to expand deficits? It could have, but it hasn't in the United States. Rather, higher deficits have just meant lower taxes, particularly on capital income, and soaring asset prices, unsupported by income flows. So, let's be clear about the problem with the recovery. The relatively slow income expansion reflects unproductive government and central bank investments in asset price support schemes. It was more a case of misplaced priorities than inadequate resources. You forget a very important element of the post crisis atmosphere in the US: a bashing of the wealthy and too great a focus on the public sector vs the private. There was plenty of capital around to invest but it was disincentivized. It is the mistake that Keynesians always make. A dollar of private capital invested is more efficient and has more of a multiplier than does public spending. 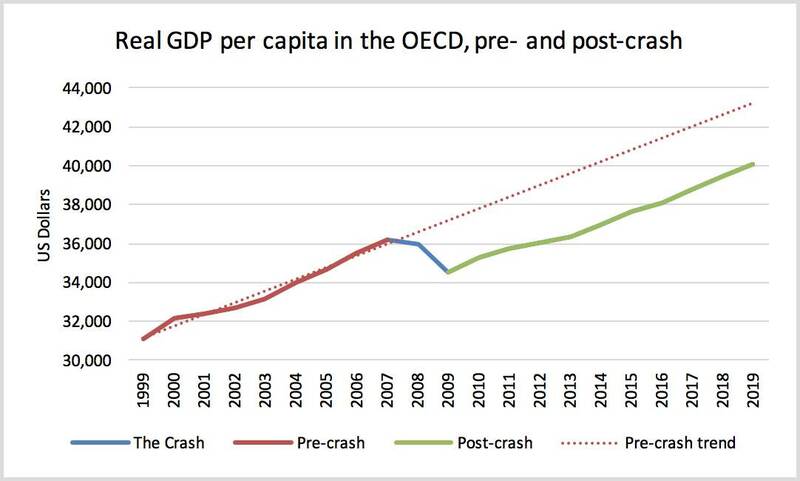 Yes there are some things public spending does well but in the aggregate it is the private sector that drives growth. I have already offered the opinion that 2000-2008 was to a significant extent (depending on the region and country) a debt bubble. Of course, debt bubbles always come to an unhappy end. However, I think there is another factor involved. To a significant extent, manufacturing production, has moved out of the USA and much of Europe. The job and GDP losses are material. One example would be Italy. By some estimates industrial production in Italy has declined by 25%. Of course, manufacturing employment crashed in the U.S. after China joined the WTO. To a significant extent, Western economies are like the old (in the USA) New England mill towns after the factories closed. The "export" industries are gone and the local economy will inevitably shrink. Tax cuts won't solve the problem. Infrastructure "investments" won't solve the problem. Debt bubbles can cloak the collapse until the bills come due. In the end, new industries must be created (by protection and other means) and built. Of course, in a world obsessed with "free trade" and the "virtues" of outsourcing that isn't about to happen. Steve, Steve . Where is Steve Hurst? Do billions of people in Asia, Africa and S. America who have to make a living out of their daily grind, care about what happened in the lost decade? What do these smooth graphs out of alphabet soup of numbers! Entirely missing from the article is any reference to the actual real-world content of the "economic" stimuli of these years. The period before 2008, with an apparently cheerful 2% growth, was fueled by two bogosities, Bushlet's random assortment of wars and a real estate bubble. The upward curve reflects an absence of misery for the working classes of the Atlantic world. The receiving end didn't fare so well. The less cheerful recovery period is a struggle for peace in the teeth of relentless rightwing opposition and obstruction. This article and the comments make valid points, however any analysis of an economy and macro policy that ignores tax policy is deeply flawed. Tax and regulatory costs favour particular economic activity over others, skewing income and wealth distribution, directing capital towards particular activities, shaping the economy and society. Here in the UK this tax skewing has created an unfettered landlord tenant economy for under 40s. The landlord with a reasonable accountant will pay no tax, the tenant employee is losing over 50% of their economic contribution after employer’s costs and profits, to taxes, dragging investment capital in to zero sum residential property investment, denying a generation the ability to build the capital for their own startup, starving small and medium businesses that make/trade/serve the investment capital to innovate and expand. For the majority of the child bearing age middle class, accessing a secure family home to start a family is impossible. The political impact of this short sighted tax policy will see a left wing anti-capitalism party win the next election in Britain. Because however loopy the economic policy of the left, when a government cannot manage the economy to enable working middle-class couples to start a family, the ticking biological clock induced panic sweeps all before it. In other words, macro analysis that uses generalised statistical data is useless because it’s lazy. Today our banks record and store every transaction. This accessible data can transform economic analysis and policy, allow a move away from crude Central Bank base rates and tax policy driven by lobbying and ideology. Impending Brexit provides an urgency to, and voter acquiescence to, the adoption of this data to shape the economy via tax. Let’s hope the UK’s political establishment can look beyond the self interest of their “buy to let” portfolios and take this opportunity to unleash the potential of their people’s economic activity. A very well-written article with strong historical support. Out of all the “lessons learnt” in financial crisis we have only learnt one lesson: which is that we did not learn a single lesson! We should all be Keynesians by now! We need a change and more about national planning than policy. The damage was done far before the 2008 crisis... all this talk is irrelevant. It was globalization and free trade that broke the system. Start working as a nation again.. make the emerging economies pay for access to the consumers and stick & carrot jobs back into place. Nigel: I share your view to a large extent. The idea of Free Trade is not mandated by gods. What we need is a Fair Trade system with a hefty dosage of economic selfishness that looks after needs of their people and national interest first. Highly Technologically developed, political , militarily powerful nations have bulldozed and rammed self serving patent rights on drugs and industrial processes on less developed nations. China may be a authoritarian state, but has raised hundreds of millions out of dire poverty. Others like India too have a right to look after their self interests first! The obvious question is the extent to which 2000-2008 growth was simply fake growth fueled by a debt bubble. In the U.S. that was certainly true. It appears to have been true in several European countries including Ireland, Greece, and Spain. In several European countries the housing bubble was worse than the U.S. (certainly Ireland and Spain). To a dangerous extent, growth from 2000 to 2008 was an unsustainable illusion. Median income has lagged behind because globalization allowed OECD companies to arbitrage labor. They moved more labor to cheaper markets. Adolph Hitler did not surface in the US after 1929. One could argue the pain of liquidating inefficient uses of capital led to the longer and stronger recovery later in the decade. In 2008 we left a lot of inefficient uses of capital that remain today. I am always newly amazed that, in discussions like this, the one major economy that maintained its post-GFC growth trajectory is unmentioned. I have yet to see a cogent comparison and contrast between Chinese policies and ours. Yes, but at least he does make a passing reference to Chinese policy and how appropriate it was. It's the first time I have seen that in any "western" media platform. But you are right that even Keynesians, who you would think would be all over that experience, just seem to ignore it. Apr 30, 2015 Stephen S. Roach opposes the advanced countries' post-crisis policy prescription.